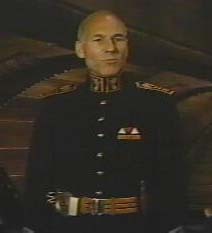 Patrick Stewart was born on July 13, 1940 in Mirfield, West Yorkshire. His childhood was not particularly happy. He began performing in several local theater groups when he was 12. He left Secondary Modern School at age 15 and began working as a journalist for the West Riding weekly newspaper. He received a scholarship that allowed him to attend the Old Vic Theater School in Bristol, and in 1959 at the age of 19, his extraordinary stage career began with his first professional role as Morgan in Treasure Island. Our Mr. Stewart is about 5 foot 8 inches tall. He has beautiful hazel green eyes that mirror whatever he is wearing, changing his eye color. Patrick Stewart began losing his hair at 19 years of age. In 1964 Patrick met Sheila Falconer, a choreographer with the Bristol Old Vic company. On March 3, 1966 Patrick and Sheila were married. In 1968, Daniel Freedom Stewart was born and Sophie Alexandra Stewart was born in 1974. Patrick is an extremely handsome man. He was a member of the Royal Shakespeare Company for 25 years and is at home on the stage in London, New York and Los Angeles. Critics have praised Stewart for his performances as Claudius in "Hamlet" and Shylock in the "Merchant of Venice," as well as in other important roles such as Enobarbus in Antony and Cleopatra. He even won an "Olivier Award" for his performance in the play as "Shylock." Patrick first caught my eye in the movie "Dune" in 1984. He played Gurney Halleck. He was quite striking in this movie. His television appearances include the BBC productions of "I Claudius," Smiley's People," and "Tinker, Tailor, Soldier, Spy." Gurney to Paul about shields. Patrick as Gurney Halleck in "Dune." Gurney to Paul about a good scar.